Men’s Soccer Makes Return to Postseason | The Gettysburgian. 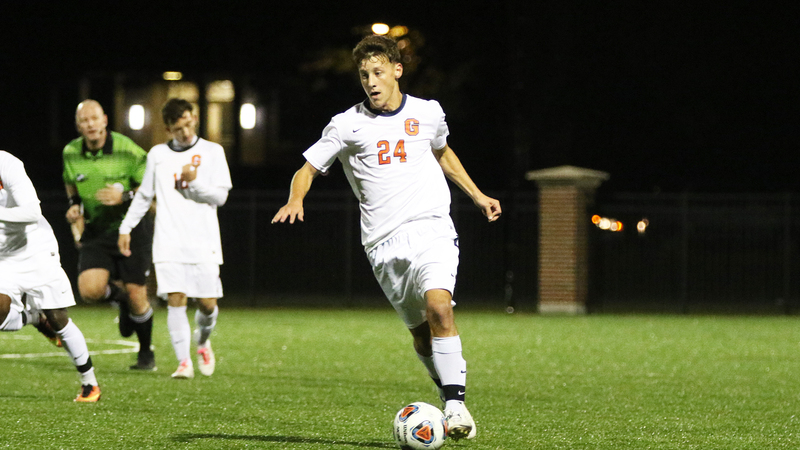 The Gettysburg College men’s soccer team took home the victory this weekend, beating Ursinus 2-1. With the win, the Bullets clinched the third seed in the Centennial Conference playoffs. This will be their first since time in the playoffs since they earned a berth in 2010. The Bullets finished the season 13-4, marking their first thirteen-win season since 2001 and will play second-seed Franklin and Marshall in the semifinals. Before the win, all 10 of Gettysburg’s seniors were honored in a ceremony for their final home game. Gettysburg struck first in the game as first year Sam Lerman scored on the team’s first shot in the sixth minute. Lerman’s fourth goal of the season would lead the Bullets to a strong start as they outshot Ursinus 7-4 in the first half. Early in the second half, senior captain Patrick Santini gave the Bullets the extra goal they needed by striking the ball past the goalie in the 52nd minute. This goal made Santini the program’s third twenty-goal scorer in its history, as well as the first one in almost 20 years since Jason Vishio ’00 did it in 1998. Senior Max Karen performed exemplarily in goal, making four saves while only allowing one goal late in the game. The defense held off the late charge in the final minutes; standing firm despite the frantic final attempts from the Bears. Gettysburg’s solid defense has been maintained especially by two strong goalies on the season: Karen and sophomore Thomas Keane. Karen has seven wins, four shutouts and 0.86 goals-against average while Keane has six wins, three shutouts and 1.00 GAA. The offense outshot Ursinus 15-6 with a 6-2 advantage in corners won as they dominated attacking opportunities throughout. He also claims one key to the season has been the energy of the team and the important role that the first years have brought to the team, saying they have improved greatly as they adjust to collegiate soccer and are learning every day. One of the team’s key defenders holding down the center back position for the team while also scoring a few goals on the season, Omosanya states that the team’s ultimate goals are to win the Centennial Conference tournament (for which they qualified) and then to make it to the national tournament. The Bullets seem poised to do exactly that on the back of an effective offense and a stiff defense, as well as two goalies that have performed well on the season. With multiple forays into the D3soccer.com Top-25 national poll, a 7-2 record in one of the strongest conferences in the region, and a third-place rank in NCAA DIII Mid-Atlantic Region polls; the Bullets are poised to make deep runs into both tournaments. By virtue of finishing in first place in the standings with 23 points, Johns Hopkins earned the first seed and the right to host the conference tournament this year. The winner of the game between fourth-seed Haverford and fifth-seed Dickinson will play the Blue Jays in the other semifinal. Gettysburg looks to continue its winning ways in the playoffs this Friday at 8p.m. under the lights against Franklin and Marshall. This will be the second matchup between the two rivals — with the Diplomats narrowly taking a 3-2 victory earlier this month.